Inspired by his mother's struggle with dementia, Patrik Kusek's winning piece is a story of "memories lost but hopefully not forgotten." A prolific metal clay artist and instructor, Patrik has been immersed in the worlds of design, fashion and art his entire life. A graduate of the Fashion Institute of Design and Merchandising and The Academy of Art University, he has been published in numerous books and publications and has appeared on HGTV. This is his second Saul Bell Design Award in the Metal Clay category. He lives and works in Fairfield California. MARLENE RICHEY: TELL US ABOUT YOUR WINNING PIECE, "MEMORY INTERRUPTED." Patrik Kusek: My mother has dementia, and this piece is specifically designed for and dedicated to her. Pearls, simulated citrines and peridots were used in the necklace. I made molds of cameos from the 1800s, when people went on their Grand Tour of Europe and collected [cameos] along the way in various towns and cities. I have purchased many of them online and use them in my current body of work. The necklace is made of silver PMC with a layer of 22K gold. 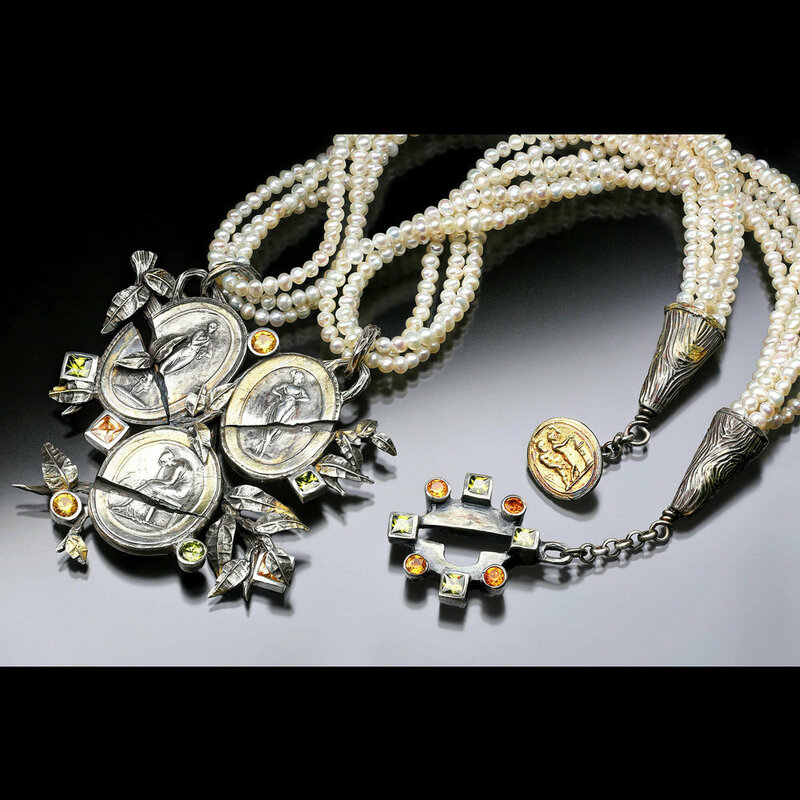 The piece is created with a special 960 silver metal clay, which is a custom mix of enriched silver. The 22K gold is also a special product made in PMC that fuses to the silver surface. I originally manipulated the mold of the cameos by cutting the PMC cameo apart, then I reassembled them to appear cracked. I work not only in metal clay but also in numerous other metalsmithing techniques. MR: HOW MUCH TIME DID IT TAKE TO CREATE? PK: This collection started with a brooch, and I worked out a lot of the technical issues making it. The necklace grew out of this body of work. But actual time to design and make the necklace was approximately two weeks, working on it part time. PK: I learned to be a little more satisfied with simple solutions and, at the same time, to be more restrained in my execution of the piece. A couple other pieces I made with this same idea and concept were much more fragmented and weren't as strong. They had a lot of cracks in them. This time I accented the single crack in each of the cameos. I guess I am saying that I learned to pull back a little bit and be more restrained. PK: I have taken a lot of classes, à la carte. I had a graphic design and branding business during the dot-com period and was making a lot of money. After a while, I was stressing out during the daytime and so I took a class in metal clay. After taking the class, I realized my love for working in metal clay. I was really happy making jewelry. At this point, I made a career change to jewelry and opened a business. I have a degree in merchandise marketing from FIDM, the Fashion Institute of Design and Merchandising in San Francisco. A while later, I went back to school at The Academy of Art University and received a second degree in graphic design. My first job was with Macy's. I helped in the accessories department there and had some wonderful experience in the bridge/fashion jewelry area. I worked on special event fashion shows and therefore had a good knowledge of this area of jewelry. I was helping other people put their ideas forward but often in my own voice. PK: One of my biggest influencers early on was Celie Fago. She opened up all the potential possibilities of working in metal clay. Her work is really great. I hadn't seen anything like it up to that point. It is so beautifully produced. She has a great style. Years later, I got to meet and know her personally while we were both teaching classes at Rio. PK: Metal clay has a low cost to start up, either as a career or a hobby. Now I mostly study metal and all the ways it can be formed. I do a lot of teaching all over the country. And I am filming videos. My work isn't in galleries or on store shelves. I sell primarily to a limited number of collectors. My business is more about how I want to spend my time, energy and passion. I like the freedom of not having to produce. And I am passionate about talking and sharing in the metal clay classes I teach. It is so great to see students' reactions to this amazing material. PK: I don't limit myself to metal clay. I also love fabrication. Harold O'Connor and Judith Kinghorn have been a huge influence in my metals career. I have worked in granulation. And I like to combine metal clay with more traditional smithing skills. Using materials in combination with PMC opens up a whole new world. Metal clay comes in so many varieties of metals that it is an exciting time to be working with it. PK: I love the commute from the living room to the studio—about 100 feet. I arrange all of my tools in containers of milk-ware glass. My tools are displayed beautifully. Creating little pockets of displays that aren't particularly jewelry-based makes the space more welcoming. Having beauty around me is always an inspiration. I also have a collection of antique watch trays in my studio. I try to make it a very personal space. PK: Currently, my favorite tool is the JoolTool. It is used for polishing. Instead of being horizontal, it is vertical. It is small and has a bunch of different components you can use. The JoolTool is in between the flex shaft and a polishing machine. The amazing thing is, you can see your work while you are polishing. MR: WHAT IS ONE WORD OF ADVICE YOU RECEIVED WHEN STARTING TO MAKE JEWELRY? PK: Don't sweat the cost of the materials so much. What we do as jewelers is not cheap. We have programmed ourselves not to make mistakes because of wasted materials. You can always send your mistakes to the refiner and have them melted down. Don't let the cost paralyze you. You can make it work. I pass this on to my students. You can't be afraid to make mistakes with metal you can reuse in so many different ways. I tell my students that part of being an artist is to make mistakes and learn from them. You can see more of Patrik's work at patriksstudio.com.